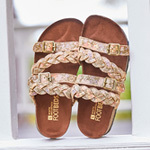 molded suedette footbed with cushion, two working buckles on ankle straps, leather upper Featuring slim straps that gently curve up the foot, the White Mountain Enamel sandal will lend a sultry flair to your evening or daytime ensemble. 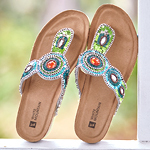 Molded suedette footbed with cushion, two working buckles on ankle straps, leather upper. Featuring slim straps that gently curve up the foot, the White Mountain Enamel sandal will lend a sultry flair to your evening or daytime ensemble.